A builder who lacks knowledge in designing and installing wine rooms does not know the importance of choosing the correct wine cellar lighting. You must keep in mind that the lighting system plays a significant role in the aesthetic appeal and functionality of your wine cellar. 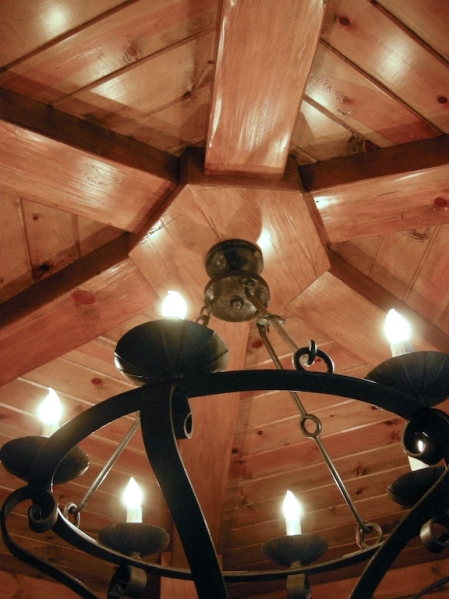 Harvest Custom Wine Cellars and Saunas, a master builder in Maryland, recommends LED lights. An experienced wine cellar designer and installer should understand that every element in wine cellar construction must be chosen appropriately. At Harvest Custom Wine Cellars and Saunas, one of the premier builders in Maryland, we use our creativity and expertise in designing wine rooms that are both safe and beautiful. Moreover, we want your wine cellar to be illuminated by a dramatic lighting system while keeping your collection safe for many years to come. We make a careful assessment of your needs to determine the most suitable type of wine cellar lighting for your needs. We had a client who sought our help because the contractor he hired for his home wine cellar project installed a fluorescent bulb, not knowing its adverse effects on the wine. The client was very disappointed after learning that some of his wines spoiled due to excessive heat emitted by the lighting system installed in his wine cellar. The owner contacted us to seek help in the installation of a safe lighting system. On your next project, make sure that you have knowledge about the different types of lighting systems and the benefits of each. It is best to consult with an expert to prevent a waste of investment. Lighting plays a crucial role in setting the ambiance in your wine cellar. In commercial wine cellars, dramatic lighting of your wine display will entice customers to view and purchase your products. A relaxing atmosphere will enhance people’s drinking experience. In home wine cellars, illuminating your wines creatively will impress guests and make wine tasting parties more enjoyable. We know that installing a high-grade wine cooling system is crucial in wine cellar construction. A refrigeration unit helps maintain a stable environment in the wine room. Moreover, the proper amount of lighting will also help stabilize the storage conditions in the cellar. Wine is sensitive to heat. Therefore, it must be stored away from windows and areas where it is exposed to direct sunlight. Moreover, it is also the reason why colored glass us used in bottling wines. Darker bottles will protect the wine from UV light exposure. Excessive heat exposure will alter the chemical composition of the wine, causing it to have a “light-struck” flavor. The cork will shrink and become brittle when the bottle is stored in a room with high temperature. When the cork loses its elasticity, it will allow an unwanted amount of air to get into the bottle and mix with the wine. This will oxidize the wine, causing it to smell like a burnt fruit or wet newspaper. You will end up throwing away the wines that have gone bad. With different lighting options available, it is easy to make a wrong choice. Do not choose a lighting system because it is affordable. If you want to avoid wine storage problems in the future, you must consult with a wine cellar lighting expert. At Harvest Custom Wine Cellars and Saunas, we always recommend the LED lighting system to our clients because we care for their wine collection. Nowadays, LED lights are in demand in both residential and commercial applications because of the many benefits they offer. They produce light using a light-emitting diode, a two-lead semiconductor light source. LED lights are known to have a longer lifespan and better efficiency than incandescent and fluorescent lamps. They also emit low heat, preventing damage caused by too much heat exposure. Since they are low in voltage, they do not produce Ultraviolet light that can be detrimental to your wine’s quality. Keep in mind though that the initial cost of LED is higher than regular bulbs. However, their longer lifespan and low energy consumption will save you money in the end. 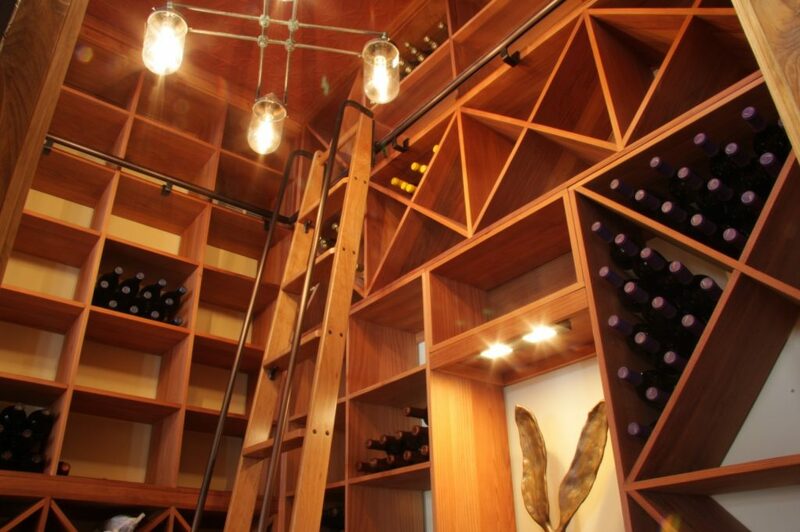 When choosing a wine cellar lighting system, we consider the aesthetic and functional preferences of the owner. We have to know which section in the wine rack the client wants to highlight to help us determine the kind of lighting system to install. For wine collectors who want to highlight bottles in the display rows or a particular section in the racking, they should opt for track light, which is also known as the spotlight. This type of lighting consists of a track head that can be moved in any direction. When it comes to installation, track lights can be mounted on the wall, ceiling, or cable. 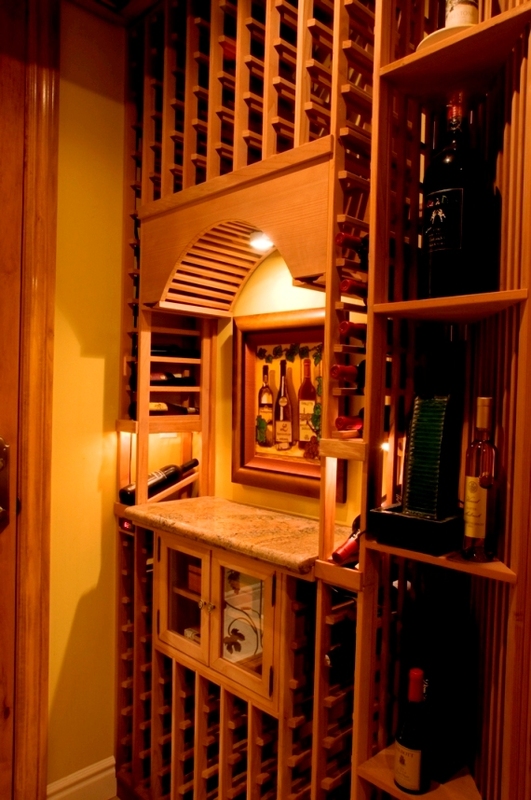 Another favorite lighting option for wine cellars in Maryland is recessed can lighting. It can be used to highlight specific areas as needed. It can also be the primary source of light in your wine room. Since they come in different styles, sizes, and shapes, Harvest Custom Wine Cellars and Saunas will help choose the best recessed can lighting for your needs. 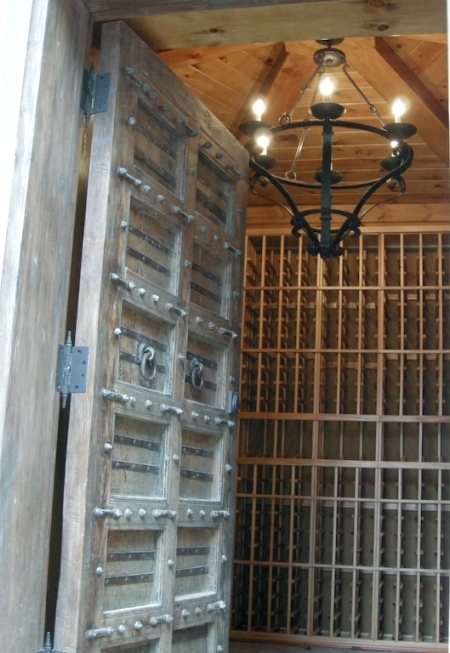 Do you want to add a royal touch to your residential or commercial wine cellar without going beyond your budget? If yes, we recommend chandeliers. This type of lighting often becomes the focal point in a room. You may select simple or ornate chandeliers, depending on your aesthetic preference. Also, consider the size of your wine cellar when choosing a chandelier. When we hear the phrase “wall sconces,” the first thing that pops into our head is “old-world” look. If you want a vintage appeal in your wine cellar in Maryland, wall sconces are a great option. Whether you want candle, electric candle, or electric bulb sconces affixed to the walls of your wine room, the dramatic lighting effect can add character to the overall appeal of your wine cellar. Illuminating your wine cellar should not be a challenging task. Harvest Custom Wine Cellars and Saunas will install LED lighting systems to help clients show off their wines impressively while keeping them safe. 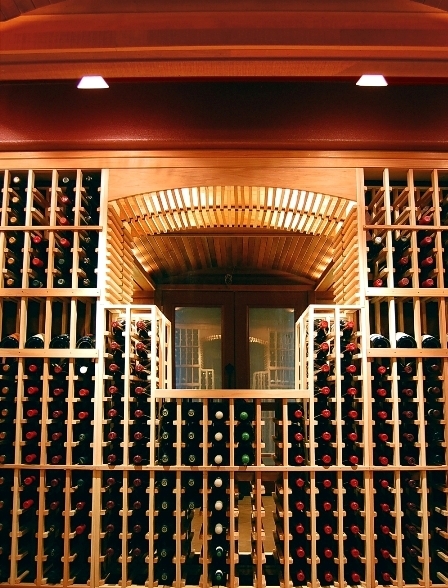 Talk to one of our wine cellar lighting experts in Maryland. Call 804-467-5816 today!